STOPit and WeTip Formally Join Forces and Lead the Market in Integrated Safety Reporting | WeTip, Inc.
Rancho Cucamonga, CA.... WeTip is thrilled to announce it's next step towards the future of anonymous reporting; STOPit Solutions and WeTip Inc. have joined forces to form an integrated operation and now offer their customers a turnkey solution for anonymous reporting and 24-hour tip management service, the two companies announced today. STOPit powers anonymous reporting programs across the country serving thousands of schools, businesses and communities. School safety concerns, the #metoo movement and increased public awareness about the importance of anonymous reporting have led STOPit to tremendous growth in the past year. WeTip has the nation's most effective truly anonymous hotline reporting service with over 1.3 million crimes reported, leading to over 16,000 arrests. Together, STOPit and WeTip's combined operations provide the most comprehensive reporting, 24/7 monitoring and phone hotline services for today's "always on" culture. "Our customers are interested in simplifying the approach to collecting tips and managing incidents. With WeTip, we now offer not only phone, web and mobile app reporting but a service desk to collect tips, route dispositions and monitor inbound messages. Together we now provide a full-service approach from one provider that is unrivaled in the market," commented Neil Hooper, CRO STOPit. "We recently celebrated our 45th year of working with law enforcement, workplace ethics and compliance, and school administrators nationwide. We have a proud history of dramatically reducing crime incidents and damaging behavior in communities, businesses and schools," added Sue Aguilar, CEO WeTip. "It is exciting to join forces with a technology leader like STOPit to offer an integrated and increasingly modern approach while staying true to our core mission of making communities safe." STOPit will manage all accounts and offer customers both the STOPit App and Incident Management system as well as hotline and monitoring services powered by WeTip. WeTip will continue to staff their hotline and incident monitoring operations, as well as provide 24-hour support services for all accounts. STOPit is the leading technology company providing a comprehensive software platform and incident monitoring service that mitigates, deters and controls bullying, including cyberbullying, harassment and other harmful or inappropriate conduct. The STOPit platform is available to schools, universities, businesses and governments both in the United States and around the world. STOPit includes a robust incident management system, empowering administrators and management to get in front of issues to mitigate risk and adhere to the ever-evolving compliance landscape. The STOPit mobile app is a simple, fast and powerful tool which empowers individuals to protect themselves and stand up for others online, on social media, in the classroom or in the office. WeTip has aided law enforcement authorities since 1972,in taking over 1,200,700 crime reports resulting in over 17,000 Crimes solved. All calls and webtips to WeTip are absolutely anonymous. No one ever knows who gave the information. WeTip has been serving the Nation for over 45 years. Live operators staff the phones 24 hours a day 365 days per year. 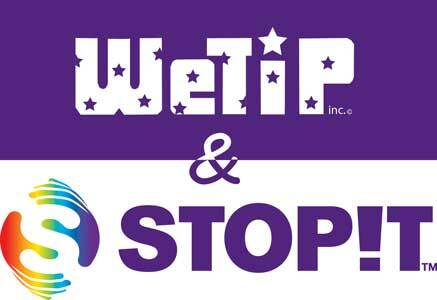 WeTip has no taping, tracing or caller ID.